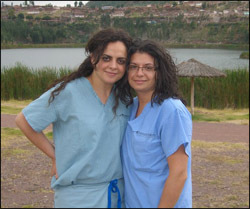 My international experience to Peru with the International Cervical Cancer Foundation, "CerviCusco", provided me with one of the most eye-opening and educational experiences of my life. 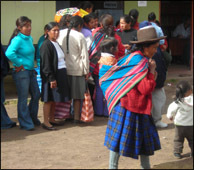 The foundation's purpose is to serve communities in Peru that are in need of Lower Genital Tract Cancer screening and treatment. The trip involved doing screening colposcopy, VIA, and LEEP procedures on local village women. The clinics were set up this year in the rural underserved cities of Urcos and Pitumarca, and having never been to Peru, I had no idea what to expect. We were greeted by the city's generous, humble mayor and townspeople who were noticeably moved by our arrival and more welcoming than words can describe. On the very first day, to my astonishment, we were told that many of these women had traveled from villages up to 8 hours away by foot, often with their children swaddled on their backs, in the hopes of being seen in the clinic. Although up to 250 patients were seen per day and ~1500 patients total, some were unfortunately turned away on our last day, in the hopes that we will return soon, hopefully with more help. This was my first humanitarian medical mission and an unforgettable one. Not only did we immerse ourselves and learn about the culture of these women, but we had the opportunity to work closely and get to know the doctors, nurses and local tour guides. Each moment was spent taking every opportunity to inform our new friends about the importance and lasting impact that continued screening and education would have on these women and their families. This mission gave me the opportunity to learn, educate, serve, inspire and be inspired, have fun and explore the history, philosophy and customs of Peru, while being immersed in the warmth and humility of its people. I also took the opportunity to take part in a few day trips. Each excursion provided a look back into the ancient Incan people and a glimpse of the current culture, one which is still very much attached to its ancient roots. On the last day of the trip, I found myself with mixed feelings of overwhelming fatigue, satisfaction, and sadness. Although cervical cancer is the leading cause of cancer death in Peru, and there is certainly great satisfaction in being a part of such a wonderful effort to save lives, I left feeling impressed by the overwhelming need this country has for overall health education and medical intervention. The 8-hour plane ride allowed me time to reflect on the whole trip and the potential impact this program may have in the future, as more and more of us get involved and fall in love with this effort, the people and the cause. Now that weeks have passed since the trip, I find that I have spent countless hours talking about these experiences that have truly filled both my mind and heart with knowledge, unforgettable precious memories, heart-felt experiences, and above all the faces of my new friends. Although this was certainly a trip of a lifetime, it certainly will not be the only one of its kind�at least not in my lifetime.